Balazar, Iconic Summoner | H.A.W.K.S. I prepped the figure in the usual way; soaking it in a dish of water with a couple drops of dish-soap added, then giving it a light scrub with a soft toothbrush, and then rinsing and drying it. The figure is sculpted with a big long mustache, which didn’t look very Halfling-like to me; so after washing and drying the figure, I very carefully trimmed off the facial hair with my hobby knife. 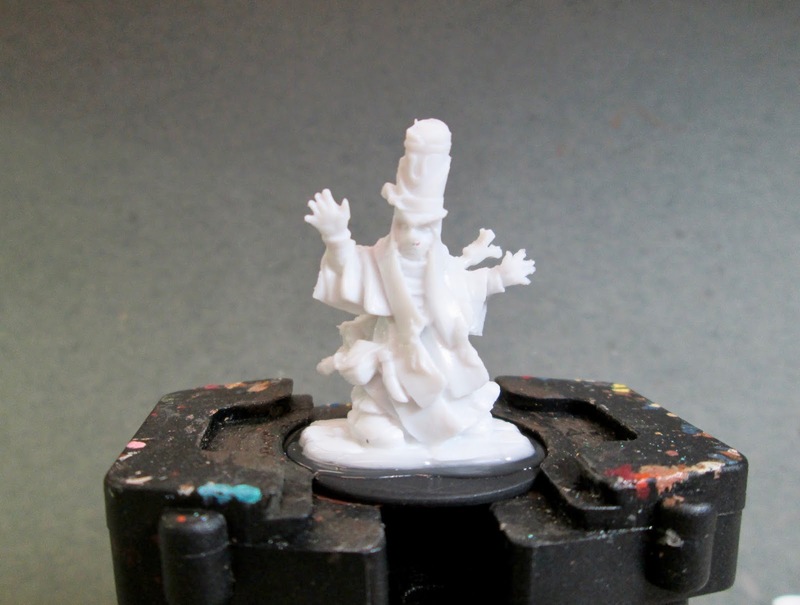 I then glued the figure to a black-primed 1" fender washer with Aleene’s Tacky glue, and then placed the figure in my painting grip. I began by giving the figure a wash with Reaper MSP “Grey Liner”; and when that was dry, I painted his face and hands with Americana “Shading Flesh”. 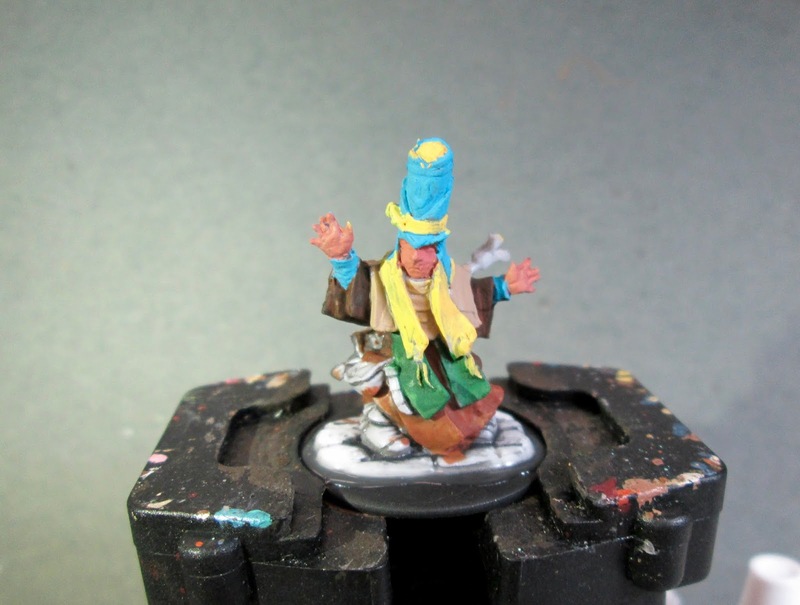 I then painted his hat and inner sleeves with Crafter’s Acrylic “Tropical Blue”, and the decoration on the hat as well as the flaps that hang down the sides, with Crafter’s Acrylic “Bright Yellow”. I then painted the flaps above the inner sleeves with Americana “Bittersweet Chocolate, and the flaps above those, that go across his neck and chest, with Americana "Khaki Tan”. 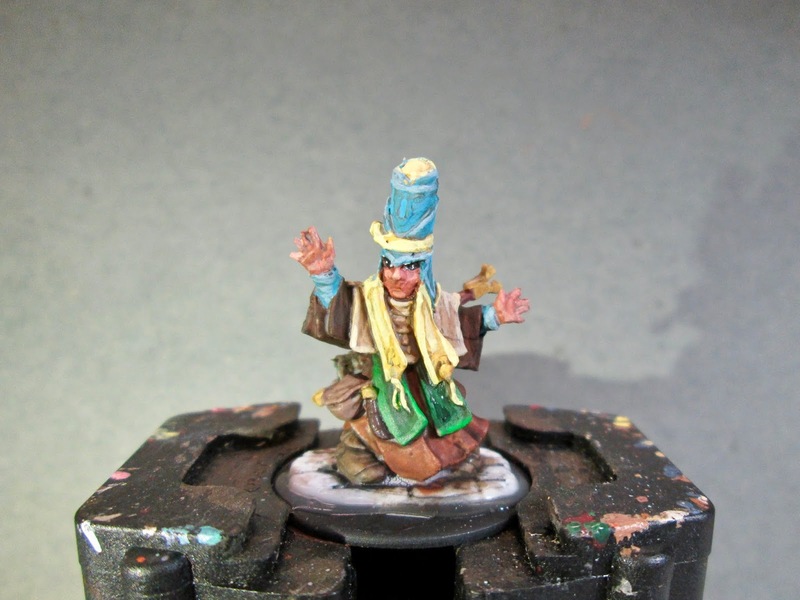 After that I did his longer robes with Americana “Light Cinnamon”, and the longer scarf with Americana “Forest Green”. Next, I painted his shoes and dagger sheath with Americana “Charcoal Grey”, and his pouch with Americana “Mississippi Mud”. I then painted his staff with Crafter’s Acrylic “Cinnamon Brown”, his blanket roll with Folk Art “Dapple Grey, and his canteen with Accent "Real Umber. After that, I painted the fittings on his dagger and sheath with Accent "Golden Harvest”, and then let the figure dry for a few hours. 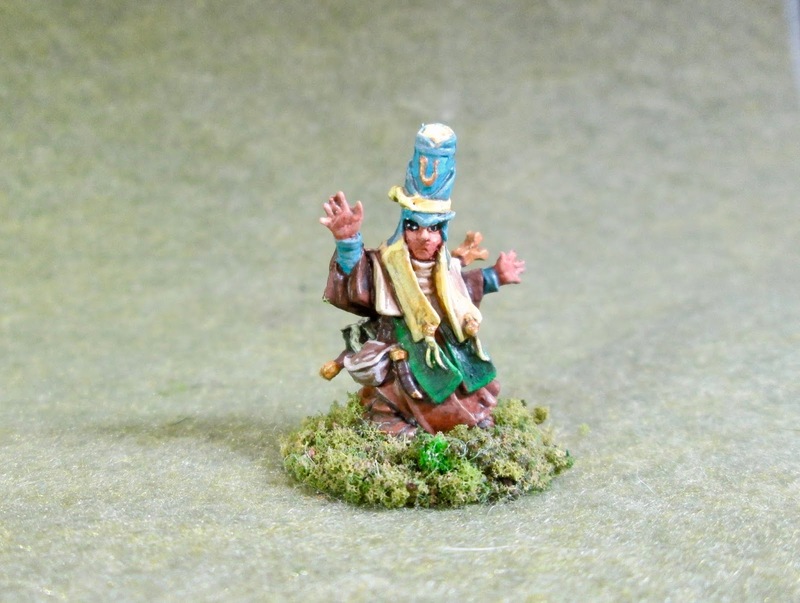 Once it was good and dry, I gave the entire figure a wash with Citadel “Agrax Earthshade” wash. When the wash was dry, I painted his eyes, and highlighted his face and hands with a mix of the “Shading Flesh” and some Crafter’s Acrylic “Flesh”. I then highlighted his hat and sleeves with apple Barrel “Apple Scotch Blue”, and the “Bright Yellow” decorations on it, as well as the “Bright Yellow” flaps, with Crafter’a Acrylic “Daffodil Yellow”. After that, I highlighted the “Khaki Tan” upper sleeve, neck and chest layer with some Americana “Antique White”, and the “Forest Green” scarf with Americana “Festive Green”. Next, I highlighted the lower level of sleeve flaps with Nicole’s “Brown”, and then the robes with “Folk Art "Teddy Bear Brown”. I did the highlights on the shoes and scabbard with Folk Art “Dark Brown”, and the pouch with Folk Art “Barn Wood”. After that, I went around back and highlighted the bed roll with Americanas “Jade Green”, the canteen with Crafter’s Edition “Spice Brown”, and the staff with Americana “Sable Brown”. I then went back and painted the fittings on the staff and dagger sheath with Ceramcoat “Bronze”, and then highlighted with Ceramcoat “14K Gold”. Lastly, I painted the figure’s integral base with the “Bittersweet Chocolate”. Well, certainly not the best I’ve ever done. I didn’t really like this figure; as I started to paint it I found all the layers and flaps of clothes more and more frustrating, as I tried to figure out what went with what: front and back, top and bottom, and even left and right. I tried to make him look like he belonged to some kind of agricultural based religion; with his clothing representative of the sun and sky, the dirt, and growing things. It kind of all just ends up being a jumbled mess. I also think I put the wash on too heavily as he looks rather smudgey. But he’s fine for tabletop use, and in the end, that’s all I wanted from the figure. I like him! Brilliant range of colours that all go together really well! Well done! Thanks! I’m glad you think it turned out well. I’m still not 100% sure about all the colors myself. I agree with JNV, those colors are really nice. 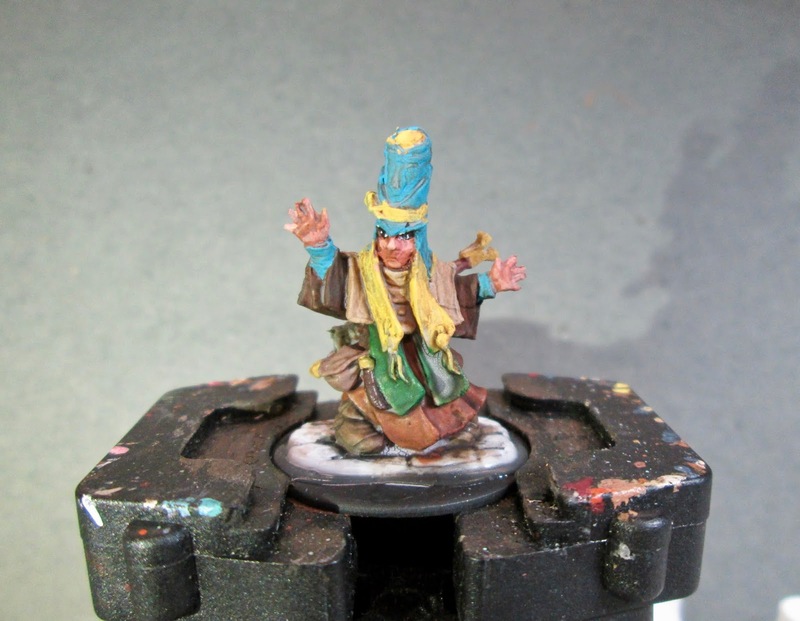 A mix of colors works well for a more flamboyant spell casters. 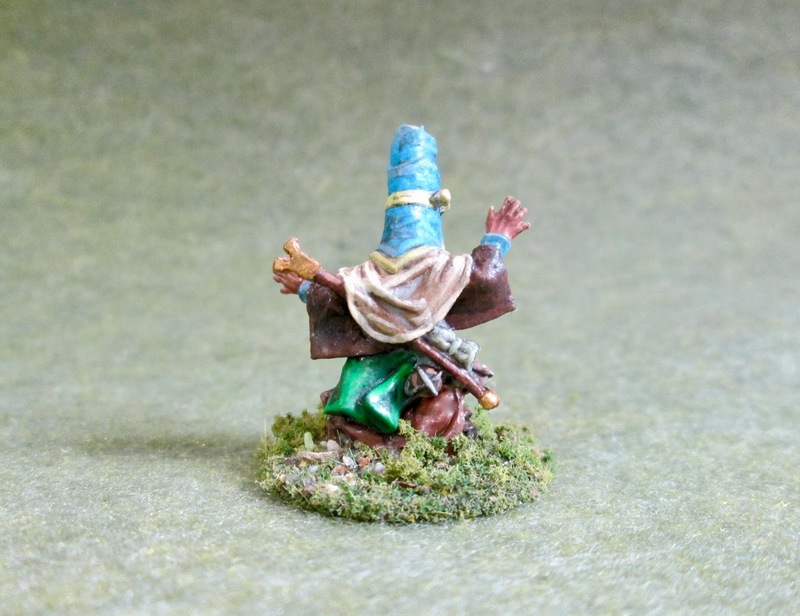 Probably the hat and the colors, but I get a Jean Giraud (Moebius) vibe from the mini. Thanks, Faust! Maybe I was too harsh in my judgement of him.